In the late summer the weather is at best changeable, strike it lucky and you’re blessed with superb panoramas, strike it otherwise and it can be pretty grim. This hike falls into the latter category with successive storm fronts forcing a change of plan. Access to the trailhead, like most Yatsugatake hikes requires taking a train to Chino Station followed by a bus connection. There are five daily buses from Chino Station to the Kitayatsugatake Ropeway 北八ヶ岳ロープウエイ (1hr, 1,250 yen). 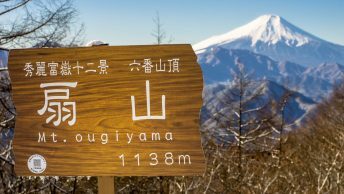 From the lower ropeway station options include a 2-hour hike to the upper station or cruising the 470 metres in elevation gain in 7 minutes (1,900 yen return). Not surprisingly most go for the later – myself included. Reaching the upper ropeway station found the plateau cloaked in fog but makes for a serene landscape. Whilst the area was reasonably crowded with day trippers most tend not to venture far. Look for a sign pointing to Amaiketoge Pass 雨池峠 along the way you will pass the 縞枯山荘 Shimagare sansou. At the four-way intersection continue straight which heads down a rocky path and takes around 30 minutes to reach the road. Turn right here and follow the access road for around 15 minutes, look for a sign pointing down to the Lake Ameike 雨池. Here is a nice place to take lunch overlooking the lake’s somewhat depleted water supplies. When you’re ready to head off, continue following around the lake in a clockwise direction. During the next section the first of the afternoon’s thunderstorms rolled through, luckily in this case the trail winds it’s way under a dense canopy providing some protection from the elements. Although it’s not marked on the map, after you hit the road there is a waterhole by means of a PVC Pipe a little way up on the left. Around 10-minutes further along there is a shortcut which cuts off a longish hairpin turn. The campsite at Lake Futagoike 双子池 (800 yen) rates pretty highly in my opinion with plenty of secluded tent sites to choose from. As a side note regarding the waterhole. The hut owner charges 100 yen per litre from an outside tap however it is perfectly safe to draw fresh drinking water from lake nearest to the hut. The second day’s plan was to summit Mt. Tateshina via Lake Kikkoike 亀甲池 and Ogawaratoge Pass 大河原峠 however about two thirds of the way up I decided to turn back due to poor visibility. I thought better to leave it for another day rather than just ‘bag’ the summit for the heck of it. 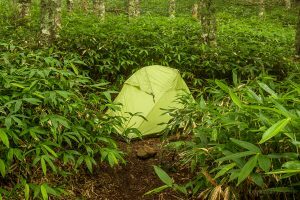 I actually found a nice wild camping spot next to a river not far from Tensho Terabaru 天祥寺原 which will make a nice staging point next time. From Ogawaratoge I made my way up to Mt. Futago 双子山 (2,223 m) where the clouds lifted momentarily providing a clear line of sight towards Mt. Tateshina. The way back down to the camping was mostly draped in mist and by mid-afternoon it was raining heavily again. By dawn it had thankfully stop raining and I was greeted with blue skies, a welcome relief after two dreary days. Deciding the weather wasn’t probably going to last, I made haste back across to Lake Kikkoike for a long and sustained climb up to Mt. Kitayokodake 北横岳 (2,472 m). This trail is pretty rocky and difficult going in the wet, though more so for hikers heading down. By half way up the mist had already taken a stranglehold on the mountain and unsurprisingly at the top there was little in the way of a view. Mt. 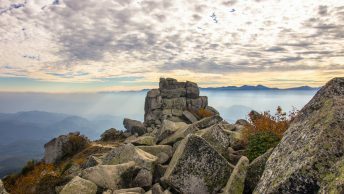 Kitayokodake actually has two summits around 100 metres apart with the lower peak officially bestowed as the true summit. From here it’s a pretty leisurely and well-marked trail back the ropeway station via the Kitayokodake Hut. Though be warned, even in weather as ordinary as this, there was a steady stream of senior citizens racing towards the summit in the opposite direction. 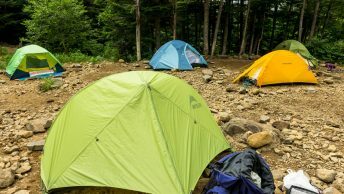 Very kind of you to say so 🙂 This trip was my third to the Yatsugatake mountains and feel I have only scraped the surface of what they to offer. Hope to be back in better weather to have another shot at Mt. Tateshina.